We are looking forward to a very powerful Summer Solstice Parade. We hope to see all your smiling faces in some capacity to show your support of the beauty and vitality belly dance brings into all our lives! The parade is about demonstrating our pride and conviction! We have an exciting plan for this parade! Blood of Life and Blood of the Earth; Valuable commodities in the world these days. Delilah’s Tuesday, Wednesday and Thursday strings are RED with small black accents. Dahlia’s Wednesday string is BLACK with small red accents. Gold and/or silver hardware is fine in all strings. In our costumes we will depict these two liquid substances. 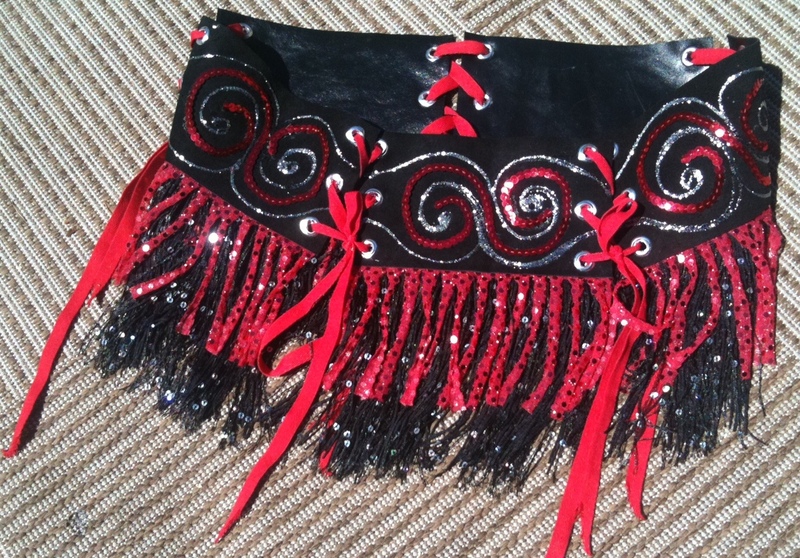 Brigitte and helpers have made up some cool Parade Belly Dance Belts for sale. They are made of panels bound with eyelet lacing and can be bought by the panel. They are suitable for either RED Blood or Black OIL dancers and volunteer parade participants. You can buy them by the panel. We will put up a photo on the parade page later tonight or tomorrow morning. You can even build a top with them maybe. Ideas: Body paint red or black with glitters, black, silver, luminescence; maybe black iris glitter to make it appear oily. We may use black and red veils or streamers and maybe even use visqueen. Props will be announced shortly. Each string (class) will hold a 20 person limit. First come (register), first serve! Sign up today! Four strings to choose from! This string also comes on Tuesdays and Wednesdays to assist the main strings. They are asked to come to as many Tuesday and Wednesday evening rehearsals as possible May 10th- June 16 and a Mandatory Dress Rehearsal on June 16th. A prize for Best Parade Costume will be given this year. Check this out! It’s going to be a little different from previous years! FREE for all parade participants. Must wear appropriate costume and come to last week’s dress rehearsal on June 16th. Please download and print our registration form>>, fill it out and send it in with a check. We also have a mail slot at the Studio. Sorry, we do not take credit cards for classes.